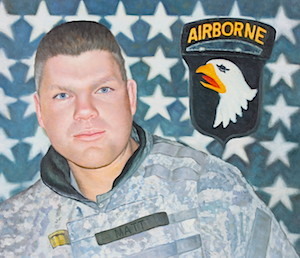 My son Matthew along with three other soldiers with the 101st Airborne Division were killed and one was injured when a roadside bomb exploded near their Humvee on January 20, 2006. Today I am here to honor my brother Matthew. My brothers and I have been through a lot together. We have fought with each other, as brothers do, we have cried and laughed as brothers. Each of us has had some unique quality that sets us apart from one another but brings us together. My brother Matt had what I like to call, “The Voice” He was the Voice of my family. From when he was a little boy to when he became a man, he was quick to tell you that our last name was pronounced Frantz not France. He didn’t care how big you were, he would let you know that. His voice, would light up a crowd, his voice had a voice of compassion, that if you asked for it, he would give you the shirt off his back. His voice flocked little kids at Sunday school, my brother loved my son very much. He used to pick my son Gavin upside down and my son would just laugh. Although he did not know him for that long he always smiled when he saw him. Matthew found love. He found love with a woman named Amalia. She was able to understand Matthew that few of us in this room today would be able to know. My brother got some colts games tickets when he was in Iraq, and surprised my dad with them, when he got home. He always helped our mother when she needed a ride to the grocery store. See that is the way brother was, a compassionate man, that knew he wanted to be a soldier from childhood. He knew that this would be is destiny. He knew that our country needed him. He never showed fear as he walked through that valley of darkness, because he knew that god and his Country his family were behind him. But he didn’t, it is God’s plan, something that we will never know nor understand, until he makes this world right again. But I will tell you while we are on this earth together what I will tell you what he IS!! My brother is smiling from Heaven saying to God, Mission Accomplished sir. In the Arms of heaven we will embrace their courage.